From weld-on rod holders to aluminum pads and flanges, BoatMetals has everything you need to make your boat be the envy of everyone on the water! ur founders started as structural welders in one of Virginia’s many shipyards. But after 7 years, they wanted to do something a little bit more fun! In 2016, that dream became a reality when the pair opened Metal Works, a custom welding shop located in Yorktown, Virginia. 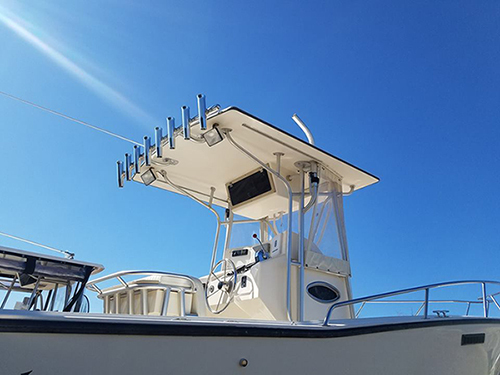 Since then, Metal Works has been providing custom towers and marine projects for boat owners all over the central east coast. Things were going great, but from our own experience and the experience of our clients, we noticed that custom marine parts were not available to the public at prices the average boat owner could afford. We began offering rod holders and other marine parts through 3rd party vendors and it was clear that there was a high demand for these products. That’s where BoatMetals comes in! Since our inception, we have been offering custom marine parts directly to consumers at unbelievable wholesale prices. We have everything you need to make your boat one-of-a-kind! We offer custom marine parts, at incredible wholesale prices! We also offer custom towers and fuel-tanks. Contact us for a free quote!